This book brings together the most relevant facts and insights on reparations and it positions the debate on reparations as part of the continuing struggle to decolonize the mind. The goal is to provide material for debate and discussion. 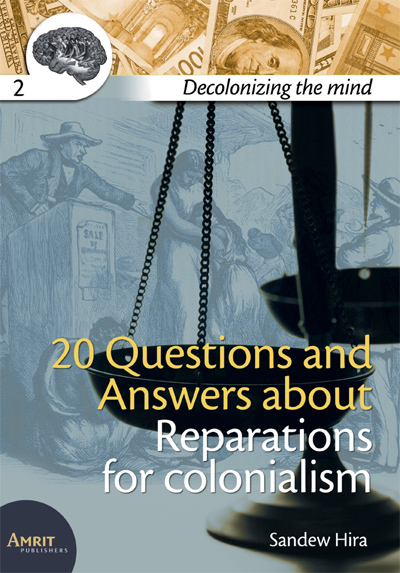 It deals with reparations for both trans-Atlantic slavery and colonialism more generally. In some sections the discussion focuses specifically on slavery because many propositions and arguments are related specifically to slavery. The final chapter presents a new economic model for the calculations of reparations. These calculations are based on a mathematical model and a computer program that performed simulations to reveal the damage that the colonizers have caused and the impact on the wealth of the colonizer nations.